For home buyers who have a particular respect for the environment, Bonita Bay near Naples, Florida is a gated community that ticks all of the boxes. The gated golfing community is a leading example of a responsible residential development, with modern estate and carriage homes, luxury villas, and high-rise condominium complexes all nestled in more than 1,400 acres of nature preserves, lakes and clean open spaces. It covers a total of 2,400 acres and is set between Estero Bay to the west and South Tamiami Trail to the east. The Imperial Rivers border on the south and the meandering Spring Creek lies to the north. 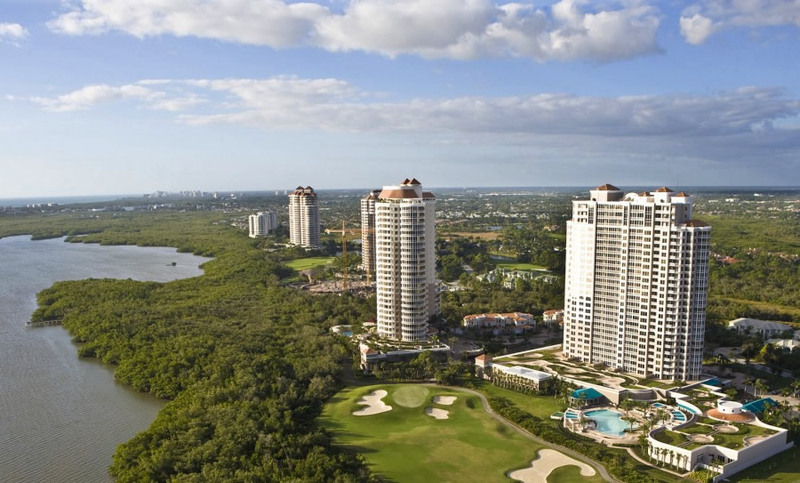 As one of the largest communities in Naples, Bonita Bay boasts some 53 different subdivisions nestled within the nature preserve, with the fairways and greens of three different golf courses – Creekside, Marsh and Bay Island – winding through them. A total of ten subdivisions offer coach or carriage homes, mostly located in the central and western sectors of the development. Their floor plans range in size from 1,800 sq ft to 2,800 sq ft. There are five mid and low-rise condominium communities in the center of the development, off Bonita Bay Boulevard. There are also eight luxury high-rise condominium communities on the western extreme all offering excellent views of Estero Bay and the Gulf of Mexico beyond it. Condos range in size from around 2,000 sq ft to 4,000 sq ft. However, single family properties dominate Bonita Bay and are scattered throughout. Expect floor plans that range from around 3,400 sq ft to over 7,000 sq ft.
Just a short journey east is Bonita Springs FL, where residents can shop, dine and enjoy family activities. And of course, beach lovers have two excellent options nearby – Bonita Beach and Barefoot Beach. The Bonita Bay Marina Club is located at the mouth of the Imperial River, leading out to the Estero Bay and then north to Lovers Key State Park and direct access to the Gulf. For young families, there is also a selection of intimate parks, like Riverwalk Park (south), Estero Bay Park (west), and Spring Creek Park (north). High-ranking schools include Spring Creek Elementary, Bonita Springs Charter and Estero High School and are located just a few short miles away. All residents have access to the exclusive Bonita Bay Club, whose amenities include tennis courts, swimming pool, fitness center, and championship golf courses. There is also a Beach Club on Bonita Bay and a marina where boats can be moored and stored. And while other developments may restrict residents to just impressive views, Bonita Bay allows its residents to immerse themselves in nature with over 12 miles of biking and hiking routes through the area.